Cameraman Newt Rossiter captured black and white footage on 16mm film, which has been transferred to video for this show. It was originally called "The Final Chapter of Canadian Pacific Steam in Ontario". Since we already had a title on South Africa called "The Final Chapter" we modified this title slightly. The show has three CPR engineers relate their experiences on most of the power that is show during the presentation, and includes 4-6-2's, 4-6-4 Royal Hudson, 4-6-0's, 2-8-0's, 5400 series semi-streamlined 2-8-2's and even a fantrip with 4-4-0 number 136. We see famous Royal Hudson 2839 in freight service and the very last fantrip with Royal Hudson 2857 which was later scrapped. There is a doubleheader fantrip with 136 and 4-6-0 815, and later a tripleheader with the same two engines, plus 4-6-0 1057. The regular service footage includes some branchline runs as well as other lines that may not be so well known during the final days of the steam era in Ontario for CPR. This is another fine show of footage shot by Newt Rossiter. Steamboy (Revere MA US) on 2018-11-28 16:08:50. 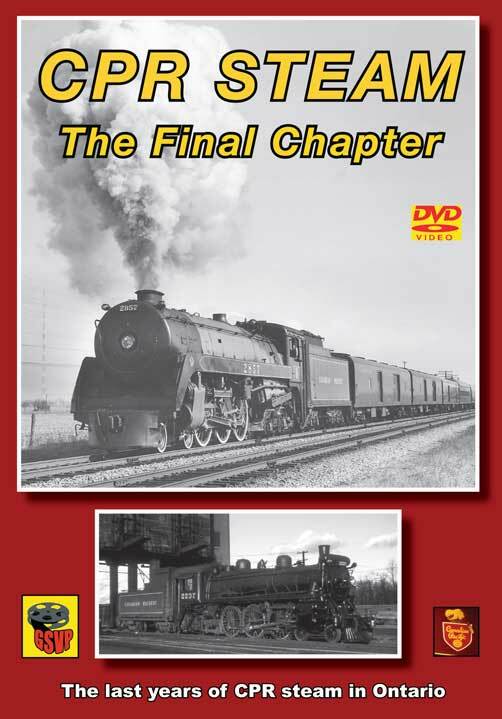 In this 1990 video/2013 DVD, we begin in March of 1959 as we are at Guelph Junction watching 4-6-0 number 1092 carrying 2 boxcars and a caboose, next we see an unidentified engine pulling only one coach. Then comes its sister engine 5405 hauling a flatbed, a Santa Fe boxcar, and a caboose. Next we see 5406 with a different coach at Guelph junction. During April of 1959, we see a caboose, a coach, and a covered hopper that is being shoved by 5406. Next we see another freight train going backwards, this time is only 5406 doing the chores, and we see the engine again at a downhill slope. At Hamilton junction, 5406 had to take some slow orders. At Campbellville we see 2214 running light, followed by 1092 with the same boxcars and caboose. At Guelph we see 1092 picking up a pair of gondolas as it turns on The wye. In May of 1959, we see a light doubleheader with 2214 and 2215 at Milton. Next we see a different doubleheader with 2662 and 5153 on a freight run. We see the freight again at puslinch. A hornby (not a British model railroad company), we see 5405 on a really short freight. Then comes 2662 alone. And then along came 2664 on a work train with a coach. At Orrs lake we see 5153 on a freight alone, followed by 5405 on a different short freight. West Of Guelph junction, a diesel was added behind none other than future famous royal Hudson (one of Greg�s favorite steam excursion stars) 2839. More scenes of the survivor on a freight was shown at Orrs lake, and back At Guelph junction running light. 2 months later in July, we witnessed a doubleheader excursion at campbellville with 2214 on the front and 2332 in the middle. Next the special turns around at Guelph junction. As the 50s turn into the 60s, we begin in April as we are at Port McNicoll as 3722 is on a long freight due to 5mph speed limits on the bridge. At melduf, we see 3722 picking up speed. Next we see the engine at Fesserton, Coldwater, and at Medonte station. We also see a meet with a diesel powered freight. At midland, we see 3632 on a freight, followed by 3722 back at Port McNicoll and at fesserton. Later that month we see 4-4-0 number 136 and 4-6-0 number 815 at Lambton. Service scenes are shown as well as alco FPA-4 idling. Then the rolling of the wheels begin as the 2 engines head to union station. At Toronto Union, the preparations continues and all to soon, we are on our way with the special down the line. The runby was made at Cooksville. At west Toronto, the doubleheader continues on its way. As April turns into May, with only 11 years before Amtrak�s debut, 4-6-0 number 1057 joins 136 and 815 for a special once in a lifetime tripleheader. Service is being made at Toronto union depot, and all to soon we are rolling down the line. Today 136 is at the South Simicoe railway. The chase picks up at streetsville, churchsville, cheltenham, and other locations down the line, until we made a stop at orangeville. Here the train backs up for a runby crossing the switches. Afterwards, the trio had to take turns turning around, and the return trip begins but ends at Alton. 14 Days later on May 15, one of the scrapped royal Hudsons number 2857 powered a 3 coach train at Clarkson. Then more coaches were added as 2857 rolls through Oakville. On June 5, we see 2857 rolling backwards at Toronto Union depot. The runby is at Woodbridge. Then the other runby is at fesserton. At port McNicoll, we see a 10 second cab ride on the Hudson. Then we came to a stop at an unknown location. Here 2857 backs up, and then runs light to turn around. Some close up shots of the crewmen servicing the Hudson is shown, and then the Hudson goes through the switch. After coupling up, we are on our way going through the 5mph bridge. The final photo runby of the day is located Noth of Bolton. This location was the photographer�s favorite runby place. We close the video with an on screen graphic epilogue. The music in this program was interesting. The 3 engineers Franklin Bunker, Donald Atkinson, And MAC Allen did an excellent job narrating this short video.